This End User License Agreement (EULA) is a CONTRACT between you (either an individual or a single entity, hereinafter referred to as "You") and SashInfo, which covers Your use of the WTK Network software that accompanies this EULA and related software components, which may include associated media, printed materials, and "online" or electronic documentation. All such software and materials are referred to herein as "Software." Throughout this EULA, SashInfo refers to Sash Info Service Pvt Ltd. which is a legal limited liability partnership firm in the state of Karnataka, INDIA. A software license, issued to a designated user only by SashInfo or its authorized agents, is required for each user of the Software. If You do not agree to the terms of this EULA, then do not install or use the Software or the Software License. By explicitly accepting this EULA, however, or by installing, copying, downloading, accessing, or otherwise using the Software and/or Software License, You are acknowledging and agreeing to be bound by the following terms. This license is for one (1) internet domain name. Each license of the software may additionally have limits imposed on the features and/or its use. These will be presented to You during Your purchase of the software and/or in other documentation and forms part of this EULA/contract/agreement. If You have purchased a license to the WTK Network software in conjunction with any other product(s) then You will also be bound by any and all licenses, restrictions, agreements, EULA's, and/or contracts for the other product(s). (b) Grant of License. Subject to a validly issued Software License, SashInfo grants to You the non-exclusive, non-transferable right for You to use the Software on a single internet domain name running a validly licensed copy of the operating system for which the Software was designed. You may not modify or create derivative copies of the Software. All rights not expressly granted to You are retained by SashInfo. (c) License enforcement. Software License is checked by SashInfo by validating the license against a license server, or a license file. (d) Backup Copy: Software. You may make copies of Software as reasonably necessary for the use authorized above, including as needed for backup and/or archival purposes. No other copies may be made. Each copy must reproduce all copyright and other proprietary rights notices on or in the Software. (e) Backup Copy: Software License. You may install each Software License on a single internet domain name and make copies of the Software License as necessary only for backup and/or archival purposes. No other copies may be made. Each copy must reproduce all copyright and other proprietary rights notices on or in the Software License. 3. INTELLECTUAL PROPERTY RIGHTS RESERVED BY SashInfo. The Software is protected by U.S. and international copyright laws and treaties, as well as other intellectual property laws and treaties. You must not remove, alter, or obscure any copyright notices on any copies of the Software unless authorized by SashInfo. This Software copy is licensed, not sold. Furthermore, this EULA does not grant You any rights in connection with any trademarks or service marks of SashInfo. SashInfo reserves all intellectual property rights, including copyrights and trademark rights. You may not rent, lease, lend, sub-lease, or in any way distribute or transfer any rights in this EULA or the Software to third parties without written approval from SashInfo and subject to written agreement by the recipient of the terms of this EULA. This license provides You with limited rights to use the Software. SashInfo retains all ownership, right, title and interest in, to and of the Software and all copies of it. All rights not specifically granted in this license, including domestic and international copyrights, are reserved by SashInfo. SashInfo may provide You with support services related to the Software. Use of any such support services is governed by the SashInfo polices and programs described in "online" documentation and/or other materials provided by SashInfo. Use of any such support services and/or any supplemental software code or related materials that SashInfo provides to You as part of the support services is to be considered part of the Software and is subject to the terms and conditions of this EULA. With respect to any technical information You provide to SashInfo as part of the support services, we may use such information for our business purposes without restriction, including for product support, marketing, development and/or any other purpose as deemed reasonable by SashInfo. SashInfo will not use such technical information in a form that personally identifies You. SashInfo reserves the right to charge You for any and all support requests that SashInfo and/or its authorized agents deem to be excessive or a misuse of the support services provided to You under this EULA. SashInfo and its authorized agents will be the sole judge in what is deemed an excessive or a misuse of the support services, and any and all associated charges and fees. Abuse and/or threatening behavior towards any SashInfo employees and/or authorized agents during the course of any support services provided to You by SashInfo will not be tolerated and SashInfo reserves the right to terminate this EULA under clause eleven (11) below. 8. FURTHER RESTRICTIONS IMPOSED BY THIS EULA. (a) You shall not use in whole or part, any code which is considered proprietary of SashInfo Software in any other software that would be freely distributed or commercially resold. You shall not modify, alter, change or otherwise make any modification to the Software or create derivative works based upon the Software. Any attempt to do so shall be void and of no effect. (b) That You may not offer or sell a hosting solution that includes a WTK Network software license and/or provide hosting with the sole intent that users would use it to host a WTK Network software installation without explicit written approval from SashInfo. 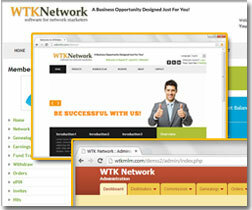 Your right to sell hosting where users install or use a WTK Network installation in due course is not affected. YOU ACCEPT THE SOFTWARE AND SOFTWARE LICENSE "AS IS", AND SashInfo, (AND ITS THIRD PARTY SUPPLIERS AND LICENSORS) MAKE NO WARRANTY AS TO ITS USE, PERFORMANCE, OR OTHERWISE. TO THE MAXIMUM EXTENT PERMITTED BY APPLICABLE LAW, SashInfo (AND ITS THIRD PARTY SUPPLIERS AND LICENSORS) DISCLAIM ALL OTHER REPRESENTATIONS, WARRANTIES, AND CONDITIONS, EXPRESS, IMPLIED, STATUTORY, OR OTHERWISE, INCLUDING, BUT NOT LIMITED TO, IMPLIED WARRANTIES OR CONDITIONS OF MERCHANTABILITY, SATISFACTORY QUALITY, FITNESS FOR A PARTICULAR PURPOSE, TITLE, AND NON-INFRINGEMENT. THE ENTIRE RISK ARISING OUT OF USE OR PERFORMANCE OF THE SOFTWARE REMAINS WITH YOU. THIS LIMITATION OF LIABILITY IS TO THE MAXIMUM EXTENT PERMITTED BY APPLICABLE LAW. IN NO EVENT INCLUDING NEGLIGENCE SHALL SashInfo (OR ITS THIRD PARTY SUPPLIERS, LICENSORS, AND PAST, CURRENT OR FUTURE EMPLOYEES) BE LIABLE FOR ANY COSTS OF SUBSTITUTE PRODUCTS OR SERVICES, OR FOR ANY SPECIAL, INCIDENTAL, INDIRECT, OR CONSEQUENTIAL DAMAGES WHATSOEVER (INCLUDING, WITHOUT LIMITATION, DAMAGES FOR LOSS OF BUSINESS PROFITS, BUSINESS INTERRUPTION, OR LOSS OF BUSINESS INFORMATION) ARISING OUT OF THIS EULA OR THE USE OF OR INABILITY TO USE THE SOFTWARE OR THE FAILURE TO PROVIDE SUPPORT SERVICES, EVEN IF SashInfo HAS BEEN ADVISED OF THE POSSIBILITY OF SUCH DAMAGES. SashInfo DOES NOT WARRANT THAT THE FUNCTIONS CONTAINED IN THE SOFTWARE WILL MEET YOUR REQUIREMENTS, OR THAT THE OPERATION OF THE SOFTWARE WILL BE UNINTERRUPTED OR ERROR-FREE, OR THAT DEFECTS IN THE SOFTWARE WILL BE CORRECTED. THE ENTIRE RISK AS TO THE RESULTS AND PERFORMANCE OF THE SOFTWARE IS ASSUMED BY YOU. FURTHERMORE, SashInfo DOES NOT WARRANT OR MAKE ANY REPRESENTATIONS REGARDING THE USE OR THE RESULTS OF THE USE OF THE SOFTWARE OR RELATED DOCUMENTATION IN TERMS OF THEIR CORRECTNESS, ACCURACY, RELIABILITY, CURRENTNESS, OR OTHERWISE. SHOULD THE SOFTWARE PROVE DEFECTIVE, YOU (AND NOT SashInfo AUTHORIZED REPRESENTATIVE) ASSUME THE ENTIRE COST OF ALL NECESSARY SERVICING, REPAIR OR CORRECTION. IN ANY CASE, SashInfo (AND ITS THIRD PARTY SUPPLIERS, LICENSORS, AND PAST, CURRENT OR FUTURE EMPLOYEES) ENTIRE LIABILITY ARISING OUT OF THIS EULA SHALL BE LIMITED TO THE GREATER OF THE AMOUNT ACTUALLY PAID BY YOU FOR THE SOFTWARE OR U.S. $1.00. 10. GOVERNING LAW; ENTIRE AGREEMENT. This EULA is governed by the laws of INDIA and USA. The United Nations Convention for the International Sale of Goods shall not apply. This EULA is the entire agreement between us and supersedes any other communications or advertising with respect to the Software. If for any reason a court of competent jurisdiction finds any provision of this License or portion thereof, to be unenforceable, that provision of the License shall be enforced to the maximum extent permissible so as to affect the intent of the parties, and the remainder of this License shall continue in full force and effect. 11. TERMINATION WITHOUT PREJUDICE TO ANY OTHER RIGHTS. This license agreement is effective until terminated. You may terminate this license agreement at any other time by destroying all complete and partial copies of the Software, related documentation and all copies thereof in Your possession. This license and Your rights hereunder shall automatically terminate without notice from SashInfo if You fail to comply with any provision of this license. This License is also immediately terminated in the event You are refunded the purchase price for whatever reason and You no longer have any rights to use the product covered under this agreement. Upon such termination, You shall cease all use of the Software and delete the Software and destroy all copies of the Software and other materials related to the Software in Your possession or under Your control. No discussion will be entertained by SashInfo and/or its authorized agents in the event this EULA is terminated under this clause eleven (11). 12. UPDATES TO THIS EULA. SashInfo reserves the right to update and modify this EULA at any time and such changes will take affect fifteen (15) calendar days from the date they are published. Notification of changes and updates will be posted in the SashInfo website, located at: http://www.wtksoftware.com. It is the Your responsibility to check the SashInfo forums for any EULA updates on a regular basis. In the event You disagree with the updated EULA, You must notify SashInfo within fifteen (15) days, and this EULA will be terminated as detailed in clause eleven (11) above. If You do not notify SashInfo within fifteen (15) days after the notification of an updated EULA is posted, You are acknowledging and agreeing to be bound by the updated version of this EULA. SashInfo does not accept any returns nor make any refunds for the Software. Not with standing the foregoing, You may return The Software and receive a refund if all of the following apply: (a) You have verified that Your Web server meets SashInfo requirements; (b) SashInfo has been unable to install The Software on Your server pursuant to a service agreement between You and SashInfo. ; and (c) the request for a refund has been made before the delivery of Your purchased product activation key(s). Your refusal to permit SashInfo to install The Software will void Your right to a refund.